Cardiac rhythms arising from the atrioventricular (AV) junction occur as an automatic tachycardia or as an escape mechanism during periods of significant bradycardia with rates slower than the intrinsic junctional pacemaker. The AV node (AVN) has intrinsic automaticity that allows it to initiate and depolarize the myocardium during periods of significant sinus bradycardia or complete heart block. This escape mechanism, with a rate of 40-60 beats per minute, produces a narrow QRS complex because the ventricle is depolarized using the normal conduction pathway. An accelerated junctional rhythm (rate >60) is a narrow complex rhythm that often supersedes a clinically bradycardic sinus node rate (see images below). The QRS complexes are uniform in shape, and evidence of retrograde P wave activation may or may not be present. Junctional bradycardia due to profound sinus node dysfunction. No atrial activity is apparent. Note the retrograde P waves that precede each QRS complex. Less commonly, the AV junction develops abnormal automaticity and exceeds the sinus node rate at a time when the sinus rate would be normal (see image below). These junctional tachycardias are most often observed in the setting of digitalis toxicity, recent cardiac surgery, acute myocardial infarction, or isoproterenol infusion. Accelerated junctional rhythm is present in this patient. Note the inverted P waves that precede each QRS complex, with a rate of 115 bpm. 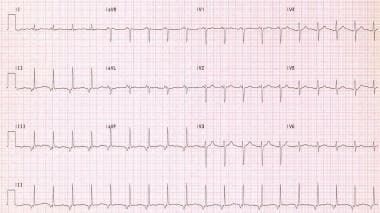 See Can't-Miss ECG Findings, Life-Threatening Conditions: Slideshow, a Critical Images slideshow, to help recognize the conditions shown in various tracings. The junctional rhythm initiates within the AV nodal tissue. Accelerated junctional rhythm is a result of enhanced automaticity of the AVN that supersedes the sinus node rate. During this rhythm, the AVN is firing faster than the sinus node, resulting in a regular narrow complex rhythm. These rhythms may demonstrate retrograde P waves on ECG findings, and the rates can vary from 40-60 beats per minute. Changes in autonomic tone or the presence of sinus node disease that is causing an inappropriate slowing of the sinus node may exacerbate this rhythm. Young healthy individuals, especially those with increased vagal tone during sleep, are often noted to have periods of junctional rhythm that is completely benign, not requiring any intervention. Ischemia of the AVN, especially with acute inferior infarction involving the posterior descending artery, the origin of the AV nodal artery branch. 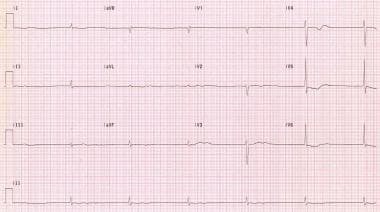 Junctional rhythms are common in patients with sick sinus syndrome or in patients who have significant bradycardia that allows the AV nodal region to determine the heart rate. Junctional escape rhythms, which are common in younger and/or athletic individuals during periods of increased vagal tone (eg, sleep), occur equally in males and females. This rhythm may occur in persons of any age. Junctional rhythms during sleep are common in children and in athletic adults. No evidence suggests increased mortality. Prognosis is good. The heart rate during a junctional rhythm often determines whether the patient has symptoms. Presence of AV dissociation can lead to symptoms in patients because of atrial conduction and subsequent contraction when the tricuspid valve is closed (ie, canon a waves). Periods of junctional rhythm are not necessarily associated with an increase in mortality. If an obvious cause is present, such as complete heart block or sick sinus syndrome, then the morbidity or mortality is directly related to that and not to the junctional rhythm mechanism, which is serving as a "backup rhythm" during the periods of bradycardia. Accelerated junctional rhythms may be a sign of digitalis toxicity. Complications of junctional rhythm are usually limited to symptoms such as dizziness, dyspnea, or presyncope. Accidental injury may result from syncope if the arrhythmia is not tolerated well. Exacerbation of cardiac comorbidities, such as congestive heart failure and rate-related cardiac ischemia, may occur. Kim D, Shinohara T, Joung B, et al. Calcium dynamics and the mechanisms of atrioventricular junctional rhythm. J Am Coll Cardiol. 2010 Aug 31. 56(10):805-12. [Medline]. Cools E, Missant C. Junctional ectopic tachycardia after congenital heart surgery. Acta Anaesthesiol Belg. 2014. 65(1):1-8. [Medline]. Deal BJ, Wolff GS, Gelband H. Current Concepts in Diagnosis and Management of Arrhythmias in Infants and Children. New York, NY: Futura Publishing; 1998. 73-5. Josephson ME. Clinical Cardiac Electrophysiology. 4th ed. Baltimore, Md: Williams & Wilkins; 2008. Libby P, Bonow RO, Mann DL, Zipes, DP. Specific arrhythmias: diagnosis and treatment. Braunwald E, ed. Heart Disease: A Textbook of Cardiovascular Medicine. 8th ed. Philadelphia, Pa: WB Saunders; 2007. 640-5. Tuohy S, Saliba W, Pai M, Tchou P. Catheter ablation as a treatment of atrioventricular block. Heart Rhythm. 2018 Jan. 15(1):90-6. [Medline]. Daubert JP, Rosero SZ, Corsello A. Tachycardias. Rakel RE, Bope ET, eds. Conn's Current Therapy. New York, NY: WB Saunders; 2001. 286-95. Di Biase L, Gianni C, Bagliani G, Padeletti L. Arrhythmias involving the atrioventricular junction. Card Electrophysiol Clin. 2017 Sep. 9(3):435-52. [Medline]. Seino Y, Sato N, Fukui K, Ishikawa J, Nakagawa M, Nomura T. Transient systolic anterior motion with junctional rhythm after mitral valve repair in the intensive care unit. Crit Ultrasound J. 2018 Nov 12. 10(1):30. [Medline]. [Full Text]. Ban JE. Neonatal arrhythmias: diagnosis, treatment, and clinical outcome. Korean J Pediatr. 2017 Nov. 60(11):344-52. [Medline]. [Full Text]. The authors and editors of Medscape Reference gratefully acknowledge the contributions of previous authors Jonathan Langberg, MD; Spencer Rosero, MD; Wojciech Zareba, MD, PhD, FACC; and David Huang, MD to the development and writing of this article.